Rectory Musings: O Brother (and Sister) Where Art Thou? 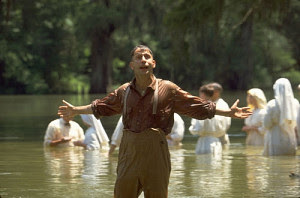 One of my favourite films of all time is ‘O Brother Where Art Thou.’ For those of you who may not have seen it, it’s about three escaped convicts are racing around the Mississippi delta looking frantically for buried treasure. They still have the shackles on their legs from the chain gang from which they escaped. They are not innocents; they’re thieves, what you might call “common criminals.” As they meander through the woods they come upon a congregation of people headed for a river, singing a Gospel song, “Down in the river to pray.” The escapees watch, mesmerized, as people wade into the water to be baptized. Two of the men are seized with an overwhelming conviction that this is what they need, that they want to turn their lives around. They wade into the water, the congregation’s singing ringing in the air all around them, and they emerge, soaked and overjoyed. Today as we baptise Craig, Samantha, Kelvin and Jessica we also remember Jesus’ baptism which started the ball rolling on his public work. It is in baptism, in this moment of heaven-ripped-open time with the God who loves him, that his work begins. It’s like that for us. Yes baptism is about repentance - which is more than a quick I’m sorry - but about seeing our lives turned round our lives around, transformed by the knowledge that we are loved whether we feel we deserve it or not. And yes, baptism is about living a new way. But also, baptism is about being claimed by God, named as God’s own much loved children, called by him to work and serve. This is true Craig, Samantha, Kelvin and Jessica as they are baptised themselves today but it is true for all of us who recall our baptism today. Every one of us has been baptised has been named by God. Baptism isn’t a naming ceremony though. As we are baptised God gives us and Jesus a new name - beloved, much loved. Through his baptism God gives Jesus a clear path of work and service for Him. Through our baptisms God has set us on a path for work and service. Discerning where this path will take us is challenging and exciting and even a little scary. After all, the heavens don’t rip open every day. Some of us are called to serve God in the church, in particular offices such as a priest, or by other kinds of service to the church. All of us are called to serve God outside the church, in God’s beautiful and broken world, and that work and service is as wide and varied as there are people. We can serve God by working for safe and peaceful communities like our own, or helping out and elderly neighbour, or by giving someone a lift to a doctor’s appointment. We can serve God by loving and caring for our aging parents or our children or even our families of choice, those who are knit together not by blood or legal contract but simply by love. Anywhere we can serve God’s people, we can serve God. Today as we remember Jesus’ baptism, we also remember our own, whether they happening within this service or decades ago. We remember, whether we were infants held in the arms of a parent or godparent, or we were adults who emerged from the experience soaked and jubilant and glowing with the love of God, we remember that baptism is about seeing our lives turned round, and the opportunity to do that is always before us, always a possibility, whereever we are wheatever we are doing, in the waters of baptism or not. In His Baptism Christ was comissioned to speak these words both so that people could hear them and in signs of the kingdom - in acts of love and compassion, in healings and miracles - so people could see them. But it’s not just about each of us hearing those words of love, it’s not even about just knowing that we are loved by God. Jesus didn’t just hear those words of love from God, he didn’t just know them to be true for him and all people, his baptism was his comission and our co-mission with him to show that transforming love of God. Today Craig, Samantha, Kelvin and Jessica we we baptise you and recall our own it is about but about each of us living and acting in ways that others see, hear and know that God loves them too. Amen. Thank you...It had never hit me before that God gives us a new name at baptism - just about the most warming thought possible as I set out to preside this morning.